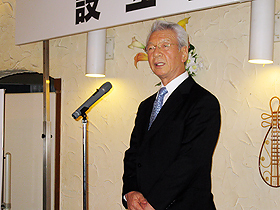 The ceremony to celebrate the JMAA foundation as a corporate organization was held at Seabornia (Nagatacho, Tokyo) on September 17, 2009, inviting 74 guests including Mr. Fukazawa (Div. Manager, National Highway and Risk Management, MLIT) and many other guests including members of JMAA board and committees. 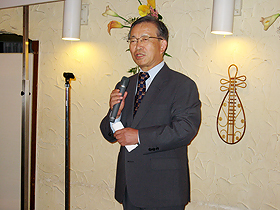 Opening remarks were made by Mr. Oonishi (President, TOA ROAD CORPORATION) delivered the opening address for the ceremony on behalf of the organization’s founders and he told that we have been involved in research and development of polymer modified asphalt for more than 30 years. Taking the opportunity of the new starting of the organization, we need to promote further efforts for the contribution to improve quality of life and to enhance public welfare. He also emphasized the necessity of enhancing the activities to be adaptable to needs for diversity. 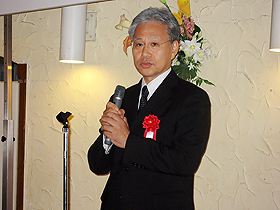 Mr. Miyachi (Representative Director) told that polymer modified asphalt have improved quality of the pavement providing highly added-value such as durability and noise reduction, and have accordingly recognized as an essential material in road paving industry. It is necessary for us to make an effort for establishing warm-mix technology by adding further value and for cost reduction as well. He expressed his decision to address to further growth of polymer modified asphalt and to consistent challenge to emerging issues.